Being on vacation or taking a trip usually invites excitement yet few people like the act of getting to their destination. Therefore, coming across ways to improve your status comes in handy. Here’s how to improve your odds of scoring a flight upgrade. Wait for a national holiday or a day banks are closed. The daytime business flights will be empty and you’ll have a chance to move up. You should get a few perks for opening your wallet a little wider. If you have a lot of bags or are already paying over $1000 for your ticket, ask about what a service rep can do about improving your seat. Sometimes it pays to spend more money. In the days of comparison shopping, vendors do more to make you a loyal customer. Rather than see which airline has the best deal, choose one, sign-up for newsletters, and see about enjoying the perks of being a loyal customer. You can try the same philosophy when it comes to hotels. See if it pays to be a loyal customer of the Marriott McDowell Mountains hotel. This tactic could backfire, so make sure you have work, a book, or something to occupy your time. Go really early (like hours early). 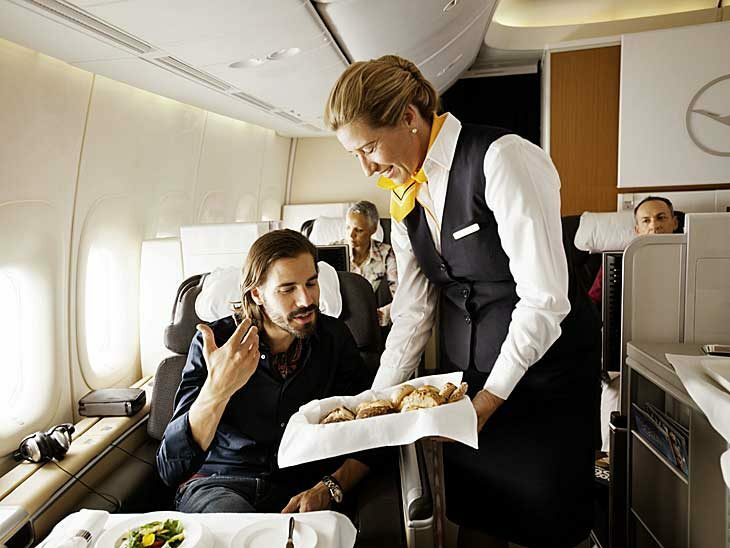 It’s not a given, but customer service may alert you about spare seats in first class. The point is that you’ll be first on your flight crew’s radar by arriving so early. Conversely, you may be able to score a better seat on the next flight if you get there late to find the flight has been overbooked. It won’t work well if you have to keep a schedule and it could backfire if you just wind-up having to hustle only to wait in line, be last to board the plane and get a horrible middle seat. 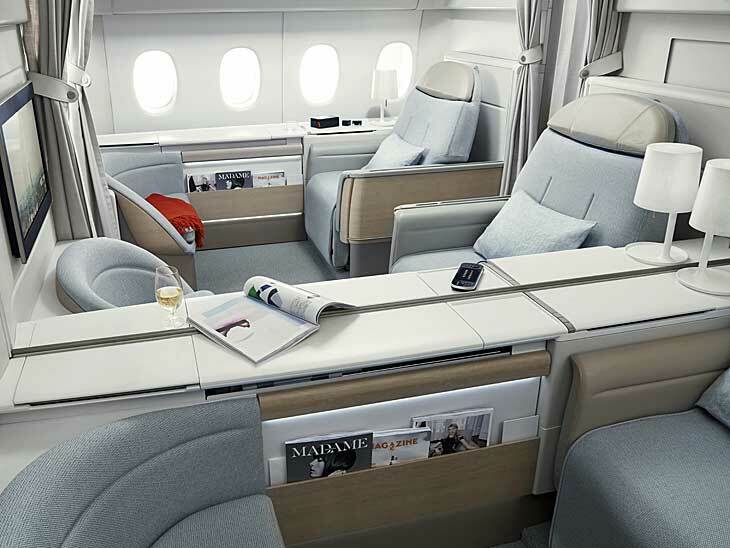 La Première – Air France First Class. You never know when the chips will fall in your favor. Don’t be surprised to find a same-day email from your airline alerting you of ways to upgrade your current seat at a minimal or no cost. You could attempt to send an email to customer service if it’s your birthday, honeymoon, or a child’s first flight. Don’t get irate. That hardly gets anyone anywhere, but if you’re critical and objective about inconveniences and errors made by your airline and its representatives, you could be compensated with a free flight upgrade or more. Those who dress their best are known to get flight upgrades and better tables at restaurants. Rather than strolling through the airport in your leisure clothes, put on a pair of heels or a blazer and see how it influences others. I was once denied an upgrade because my travel companion wore denim jeans. 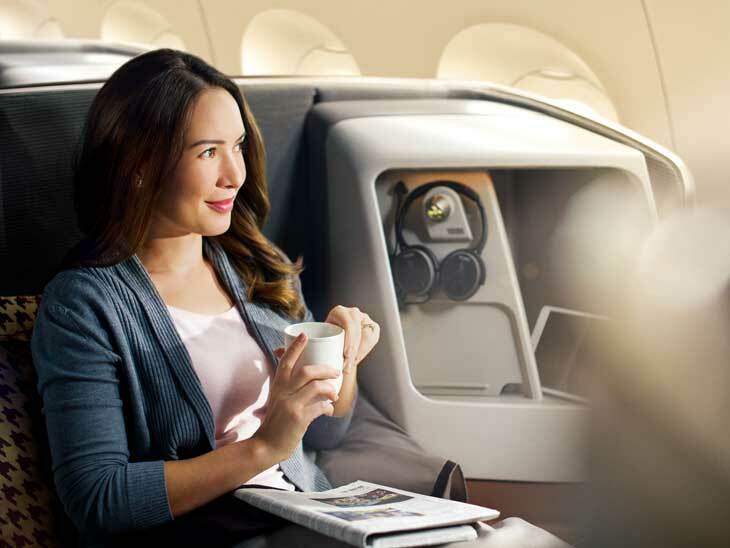 Singapore Airlines Business Class on Airbus A350. Some consumers believe that everything is negotiable. It’s the reason some people will be bold enough to ask for a flight upgrade. Of course, this won’t work all the time, yet if there is a first-class seat open, in theory, all it takes is for someone to inquire about other options to get a boost. If you enjoyed this article and care about quality travel, then you most likely want to read How to Get the Best From Your Travel Agent. Do you have more tips & tricks to score an upgrade? Please get in touch via the comment function below, via email,on Twitter, Facebook , Instagram or Google+.